The primary function of the clutch is to couple and uncouple engine power to the transmission upon driver command. For additional information, refer to Section. 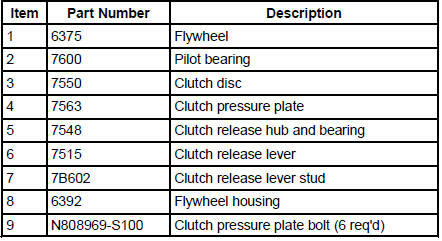 The clutch is a single plate, dry friction clutch disc. The clutch disc has a splined hub with integral torsional springs. The clutch disc hub attaches to the input shaft. Engine output is coupled to the transmission input shaft by friction existing between the clutch disc facings and the flywheel/clutch pressure plate assembly. The extent of this friction is directly related to the composition of the facing material and the magnitude of the clamping forces exerted by the clutch pressure plate and the flywheel on the facings. These factors limit the amount of torque that can be transmitted without slippage. The clamping force is obtained from a diaphragm spring contained within the clutch pressure plate assembly. 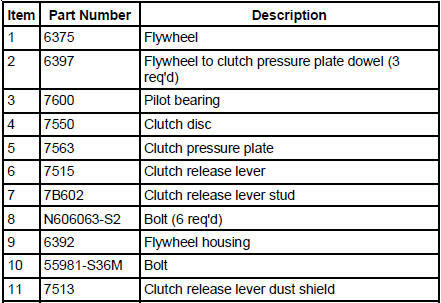 This force is developed during the attachment of the clutch pressure plate assembly to the flywheel. The clutch system is disengaged when the clutch pedal is pressed and is accomplished when the release fingers are fully displaced toward the flywheel. This displacement removes the spring load from the clutch pressure plate and eliminates the coupling friction between the engine and the transmission. When the clutch pedal is depressed a cable connected to the clutch release lever, hub and bearing actuates the clutch pressure plate diaphragm spring, releasing pressure on the clutch disc. This eliminates the engagement between the transmission and the engine.